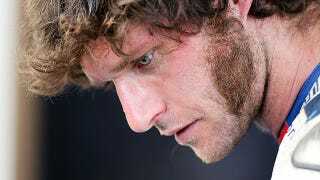 Guy Martin had a massive shunt at the Ulster Dundrod 150 Superbike race, hurdling him into the barriers after sliding out in a corner resulting in a broken vertebra, ribs, and sternum. But no biggie. He’ll be back to work tomorrow. The 11-time winner of the Ulster GP was surprisingly lucky when he crashed out on the final lap of the race last week. The Tyco BMW rider was being pursued by Bruce Anstey when he went off, slamming into a set of barriers that were protecting him from a tree. He’s been undergoing treatment at the Royal Victoria Hospital in Belfast for the past five days, and says he’ll be back tomorrow. However, there’s some concern that his injuries will put Martin’s chance at breaking the world land speed record in the Triumph Rocket III Streamliner at the Bonneville Salt Flats later this year in jeopardy.